It occurred to this jester that I needed to do the same for Pacanów (adjoining parish) which was my grandfather’s birth parish. It is especially true since vital records (Birth / Marriage / Death) recorded in the parish only go back to 1875 and that is also true in the Polish Archive (AP Kielce) and sadly also true in Diocessan (Church) Archive (AD Kielce). So sad that backup copies of the church records were not sent to the Diocese (like Biechów). In some cases they overlapped. In other cases we see gaps. So information may be incomplete. Pastors / Plebani, Deacons, etc. All (above) were Catholics buried in cemetery. 1923 Pawel Rotter – a very much accomplished Pacanow (and surrounding areas) administrator. I think we have a hint (by red arrow in picture). In Pacanow, he built 5 altars; 4 of those altars burned. So this hint, may explain why no church records exist prior to 1875. Why 1875-1918 church records (and presumably so on) were saved is not known. Stanczyk is always looking for information about his paternal 2nd-great-grandfather (prapradziadek), Marcin Eliasz or his great-grandfather Tomasz Leszczynski. So it is not a surprise that these two ancestors would top my list of 2019 genealogy goals. I would also like to find my aunt Alice Eliasz Stickney’s (Aleksandra Elijasz) birth record from Pacanow parish in 1909 or 1910. So those would be my heartfelt desires for my genealogical research. So my best bet may be utilizing the AP in Kielce. 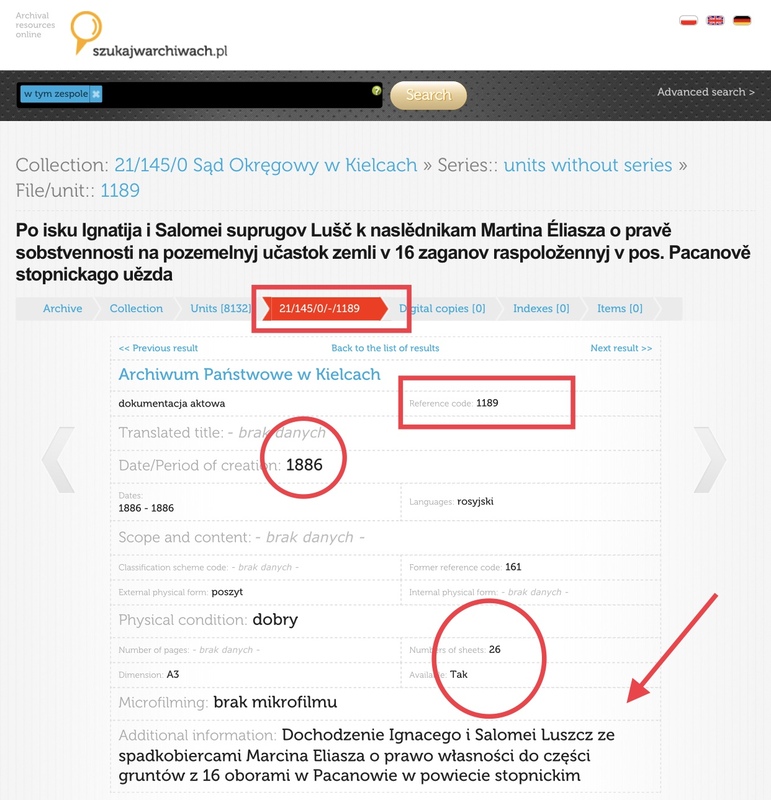 Now most people probably think of finding parish church metrical records or USC record in the archive and these are undoubtedly the most popular use of the online version of the archive (szukajwarchiwach.pl). Of course, at present, very little of the archive is actually online, beyond its metadata. I clicked on the one in the red box. Oddly, the text appears to be Czech. It’s not Polish and Russian has no diacriticals. When I clicked, I got the details (shown below). I also highlighted some pertinent areas in red. 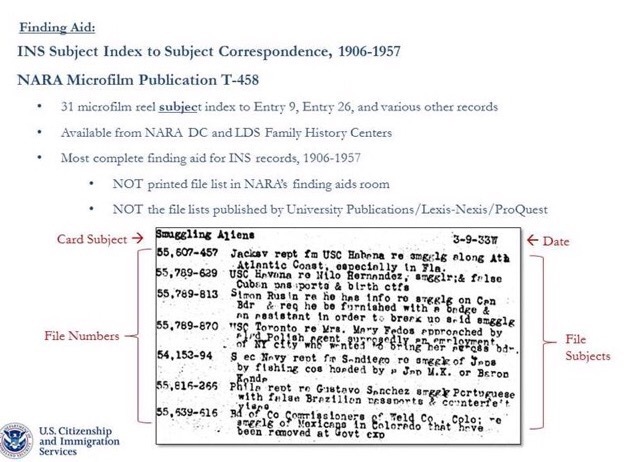 At the top, we see “21/145/0/-/1189” that is the full reference #, if you needed to request this from an archivist. I also highlighted the “1189” the last part as it is a kind of file #. I know the year is important for my research, hence the “1886”. I also knew that the # of pages (strony) of “26” would be important too. Finally, at the bottom, I pointed an arrow to the Polish text for the description (that I thought was Czech—). You could translate the Czech or the Polish, but my understanding of Polish/Polish genealogy, led me to use that instead. 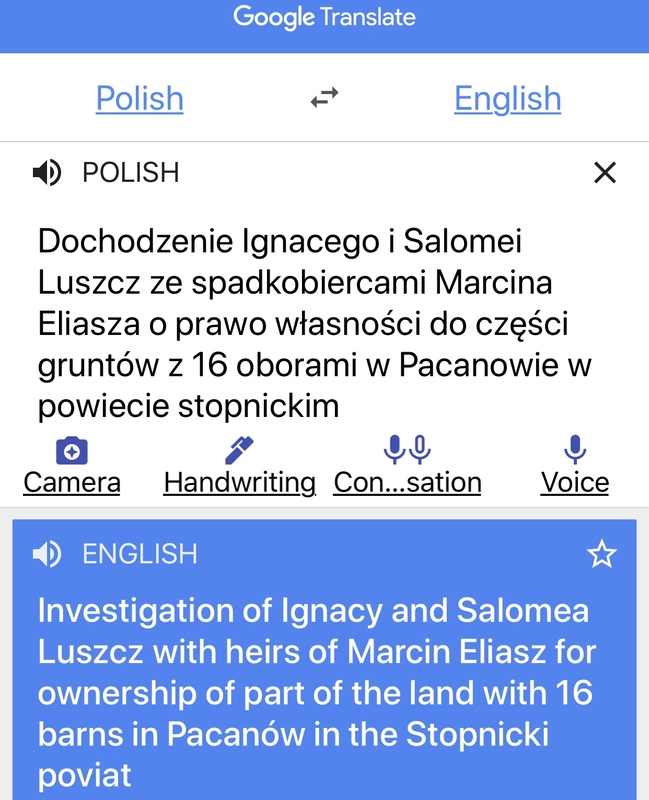 So, I went to Google Translate and pasted the Polish (that I selected and copied – not shown). Now it became really interesting to me. It appears to be about my great-great-grandfather(prapradziadek), Martin Eliasz who died in 1879 and who lived/died in Pacanow. 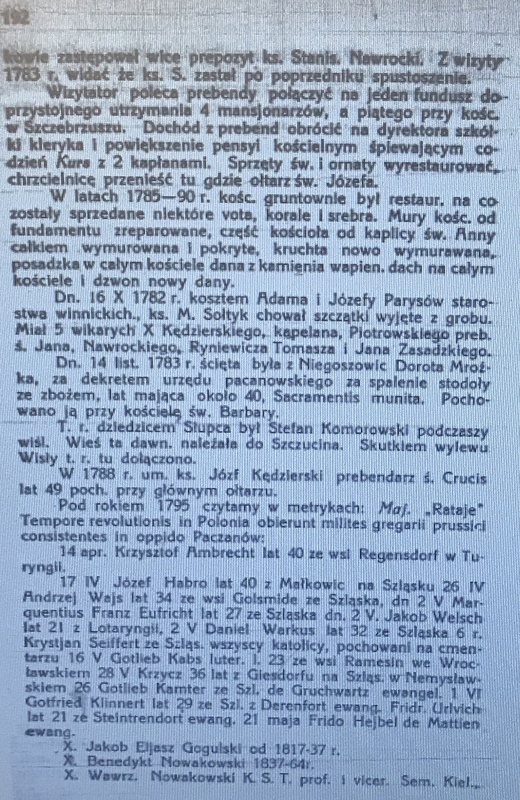 Readers of this blog may remember, a blog article back a bit, where I found an historical newspaper account in “Gazeta Kielecka” from 1879 where my 2x great-grandfather was attacked by horse thieves and there was a mention of his father’s barn in the crime story. 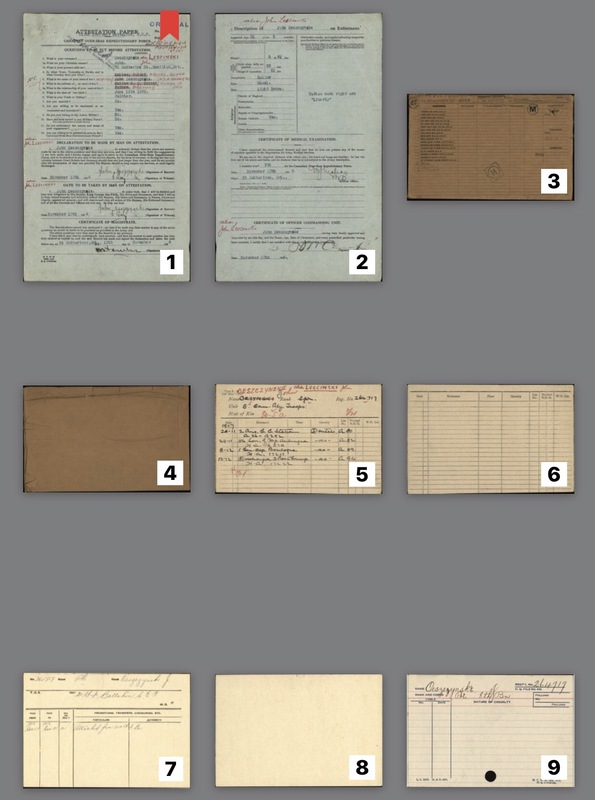 So perhaps by emailing the archive, I will try to acquire the file, with its 26 pages to see if there is a bit of probate history on Marcin Eliasz (show above) and at least inquire about Aleksandra Elijasz (my aunt / ciotka), daughter of Jozef Elijasz & Waleria Leszczynska born in either 1909 or 1910. Does anyone have any tips for bank wires or money transfers to the Polish Archives? If so please email or post a comment to this blog post. Dziękuję! Good searches a Happy New Year 2019 / Szczęśliwego Nowego Roku 2019 r.
In particular, 1909 – 1912 [inclusive] since those are not available online. 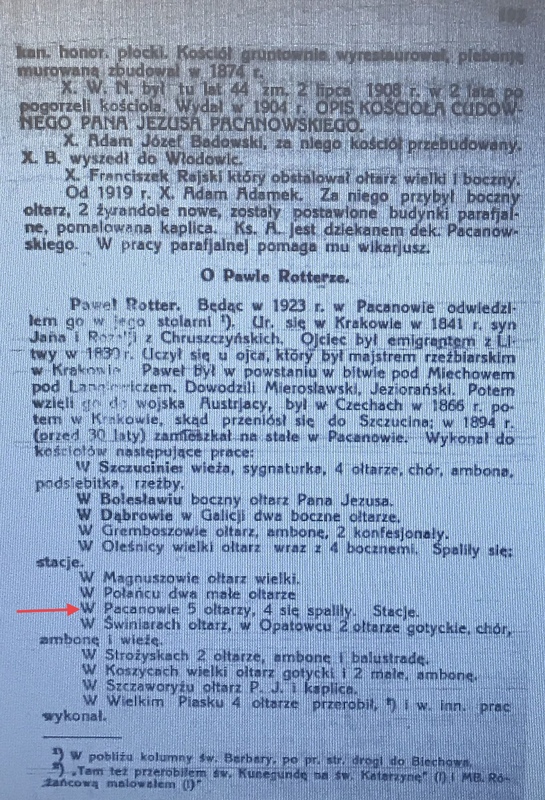 Register of inhabitants of the Pacanów settlement: (various streets ref #14-#19. Stanczyk, back in August (25-Aug-2018) wrote about Swiniary parish. Through the help of a lovely woman (Marlene Hardman), I was able to view some images from that parishes indexes (1879-1884). I did find a handful of family names that need some further research. But today I wanted to put a quick blog and let people know that you can take a peek too here. Going forward, this jester will try to compile a list of names from the marriage indexes in case others have family from Swiniary! P.S. I updated my Kielce inventory with the new SzukajWArchiwach scans for Kielce that are now online. The updates were ate the old blog article here. 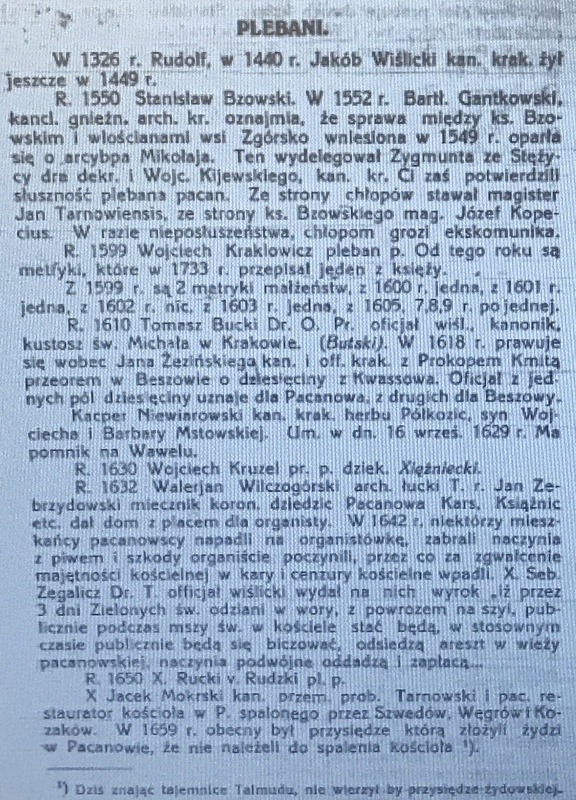 Stanczyk woke up this morning (angering the devil & his daughter 😇), to see that SzukajWArchiwach.pl (Kielce AP) added 2 Million more scans to bring their archives’ total to 34 Million scans online! I guess this jester will be updating my inventory of Kielce online scans in the near future! Stanczyk felt it was time again to survey the gubernia, Kielce Gubernia (Kieleckie). This jester was surprised at the number of new scans made available since the last survey/inventory. To use these sources, you need to have a user-id/password and be logged in…except the SzukajWArchiwach requires no authentication to use. 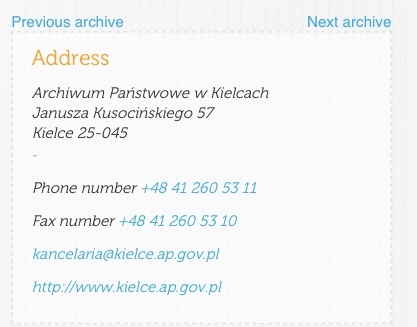 These are the Kielce Gubernia records that ARE ONLINE! There may be other records available in the parish, the USC, the National Archive of Poland or in the Church Archive (Diocessan). A total of 14,370 more scanned images (approx. 60,000-140,000 new records in Kielce gubernia). How to find government military records. If you have a name of an ancestor who may have fought at Vimy , you should start by searching Library and Archives Canada’s online database of Personnel Records of the First World War. 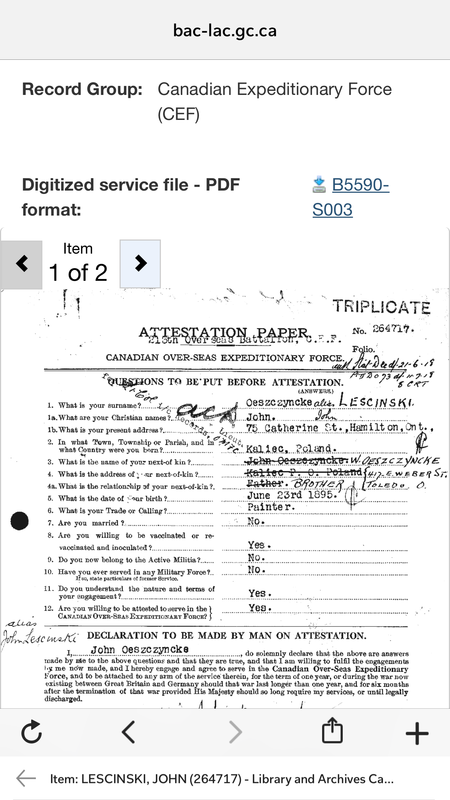 The Personnel Records of the First World War database includes the Canadian Expeditionary Force Service files. So far (1-April-2017), nearly 417,000 out of 640,000 of these full files have been digitized, with more added every two weeks. 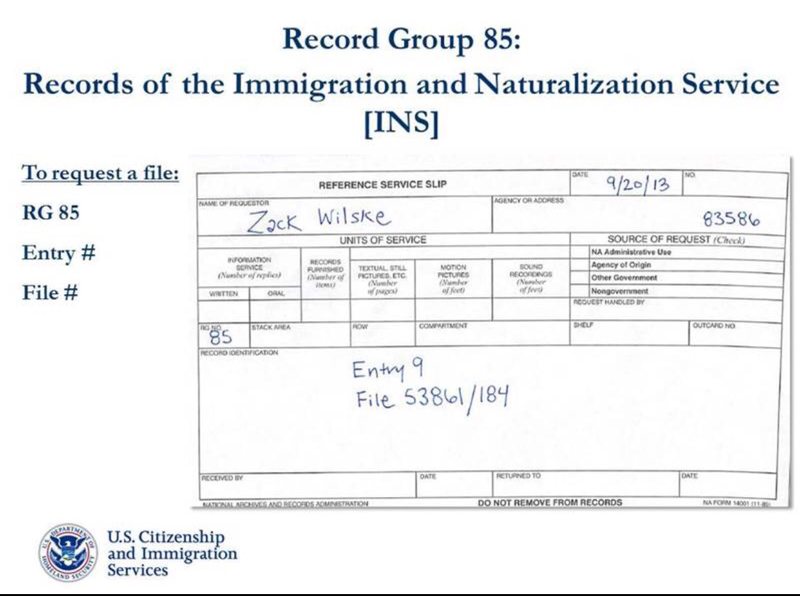 The service files are typically 25 to 75 pages long and include records on enlistment, training, medical and dental procedures, disciplinary actions, payments, medals, discharges and deaths. 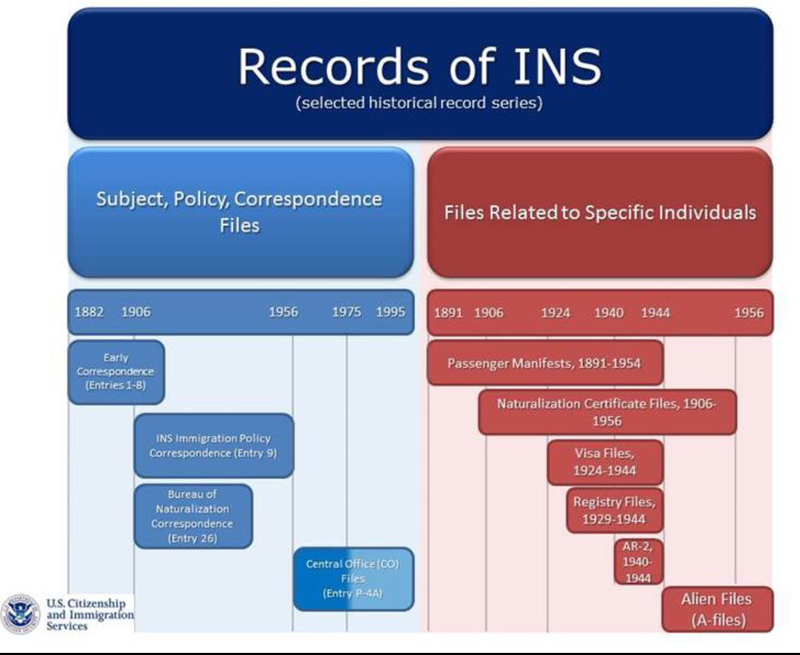 In cases where the full service file isn’t yet uploaded, you may still be able see digitized enlistment records that contain birthplaces, next of kin, addresses, religions, trades and physical characteristics. Start by typing in the surname and hitting search on this page. Click on the name in the search results. You will likely see an uploaded image of their enlistment document that you can click on that to enlarge it. If you also see the words “Digitized service file – PDF format” followed by a number, click on the number and the entire scanned service file will open. These files are very large so it may require a fast internet connection to download, or take minutes to appear on your screen. For example, you can see the first nine pages of John Lescinski’s service record (top of blog). 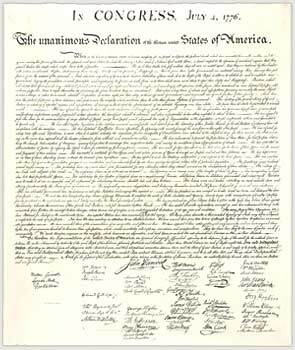 In thus case there were forty (40) pages in the accompanying PDF. It’s not always clear in the service files whether a person served in a particular battle, like at Vimy Ridge. However, that may be found in the online database of War Diaries of the First World War, which include daily accounts of what troops did in the field. These diaries contain very little personal information, but do show where units were deployed. Take care. It only showed my first two pages with a link to download the PDF (which actually had 40 pages). Macomb County, Michigan is an interesting county. To whit, there had been four cities in Macomb county who maintained their own vital records, instead of the county clerk. Those four cities are: Eastpointe, Saint Clair Shores, Sterling Heights and Warren. Now wouldn’t you know those just happen to be the major cities of the ELIASZ clan in Michigan. This jester just assumed that Macomb county had those duties. No wonder genealogy is hard, the exceptions get you. Now this came to light recently when in November (2015), Eastpointe decided to turn over its birth, death record keeping to Macomb County. 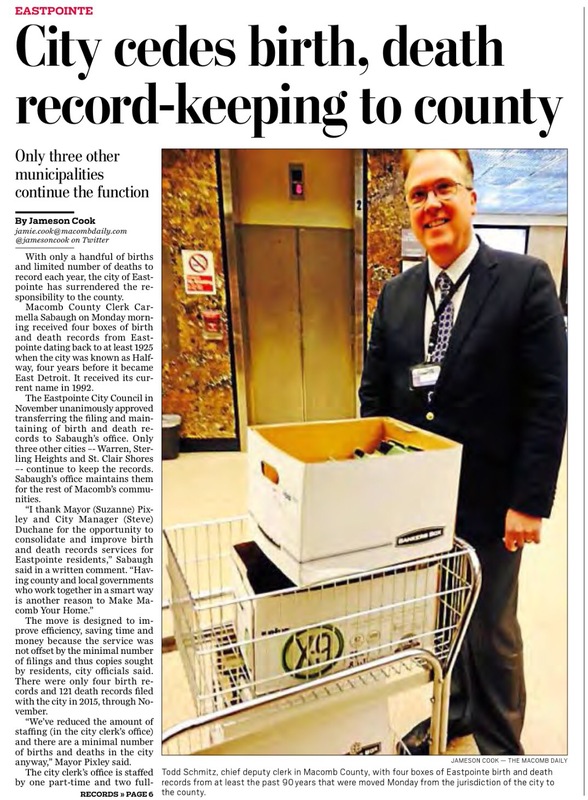 Eastpointe turned over to the county 90 years worth of vital records. The records date back to 1925 when Eastpointe was known as Halfway (I did not know that), in 1929 it became East Detroit, and finally in 1992 it became Eastpointe. So if you were missing data from Halfway/East Detroit/Eastpointe now you may be able to find them at the county clerk’s office in Mt Clemens. For those whose data is in St. Clair Shores, Sterling Heights or Warren, now you know the data if its not in the county clerk’s office is in those cities’ municipal buildings. See today’s Macomb Daily newspaper. Both branches appear to be Albanians (Arbëresh) and were founding families from 15th century migration from Albania to the remote Italian states of the Southern of Italy and even a few in Sicily too. These were from the Princes of Albania and their retinue and warriors. This had no online record images as other Italian State Archives did . Please note the phrase, “dostęp tylko dla indeksujących” means only access to indexes (for indexing?). So it appears we will be getting some new data (and/or images) online very soon. Previously, Stanczyk has written about what is available online for the former Gubernia (or Województwo) Kielce. In this article I am listing the SzukajWArchiwach.pl parishes online with year ranges and scan image counts. Please notice that links are provided for you to go directly to those you are interested in or you can go to the list of all parishes available (since as you know an article like this becomes out of date periodically). Stanczyk noticed yesterday (18-JUNE-2014) that Metryki.genebaza.pl had some additions. The Polish Archive from Gdansk (AP_GDANSK) was added to Genbaza.pl late on Wednesday. The top archive, AD_Kielce, is a Diocessan archive, the church archive from Kielce Diocese (Stanczyk’s ancestral diocese). The new archive is second in this list, AP_GDANSK. The church archive and the bottom four archives were already there. If you click on the AP_GDANSK, then you will see five research collections (aka fonds). One is an evangelical parish from Krokowa and there are also four USC (civil registration offices, similar to the USA’s county clerk) fonds with vital records. I looked at two of the USCs (Sopot – a very nice resort town on the Baltic and Kamienica Szlachecka). Their data started at year 1874 and each link was either a Birth or a Marriage or a Death metrical book. Each vital record type was a separate unit. So you had three units per year. My early searches did not locate any alegata in 1874 Sopot. As you may have surmised this is Prussian-Poland partition data and as such is in the common German long-form birth (or marriage or death) certificates (not the Napoleonic Codex paragraph form of Russian-Poland nor the Latin Box format so prevalent in Austrian-Poland partitions. The form’s text are in German. The first birth record I saw was in 1874 Kamienica Szlachecka Births (#1), was Otto August Carl Mark (son of Ferdinand Mark & Amalie Mark nee Gohrbanet). Stanczyk has recently written [24-May-2014, “Online Inventory of ŚwiętoKrzyskie (an update)” ] about what is on-line from the Kielce Gubernia/Wojewowdztwo … so of course you know that means — the information is out of date already in this Internet Time world of ours! Just today on Facebook I saw announced: New records added to Szukajwarchiwach: http://szukajwarchiwach.pl/media/attachments/swa_share_06_2014.pdf on Polish Genealogical Society of Michigan page. 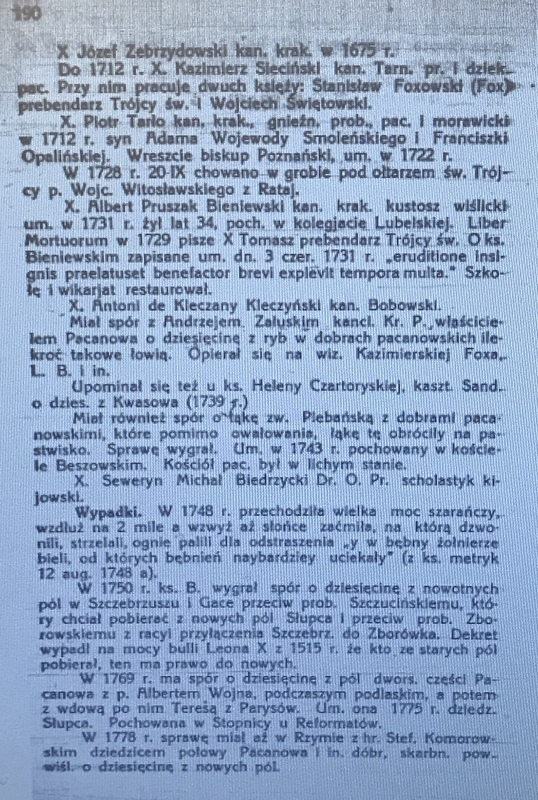 This jester examined Jędrzejowie where some distant Eliasz (aka Elijasz/Heliasz) were known to live. 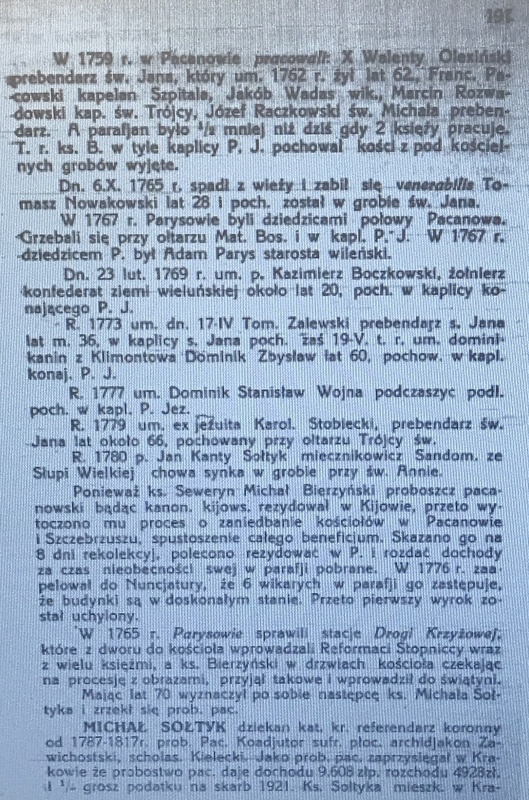 I am envious, a complete or nearly complete century of records [1812-1911] for Birth / Marriage / Death (urodzeń / małżeństw / zgonów) and even Alegata too in most cases. That is a nice way to end the week! Powodzenia! Last year (December 13th, 2013), Stanczyk wrote about an “Online Inventory of ŚwiętoKrzyskie “(or old Kielce Gubernia) Parish Books. It was produced from a Polish website: http://www.ksiegi-parafialne.pl . That was before I could go through its collected data. It appears some of their info was inaccurate / misleading about whether there was an online database at the links they mentioned. It was certainly before GenBaza.pl was loaded with some regional Polish Archives data and it lacked any mention of the Polish Archives themselves: http://szukajwarchiwach.pl . Today’s blog is a three page posting, or rather a re-posting of a Facebook posting I made in Polish Genealogy Facebook page. This is just the GenBaza data for old Gubernia: Kielce/Kieleckie. This is a long read — hence the read “More …” breaks. Gminy Pisar — which I am translating as Secretary of Gminas. One witness was the Gmina (singular) Mayor. Politically connected? Oh this is the 28-October-1882 birth record of Pelagia Maria Kędzierska who will grow up to marry my grand-uncle Jan Elijasz. On Easter Sunday, Stanczyk wrote about Logan Kleinwak / Genealogy Indexer. 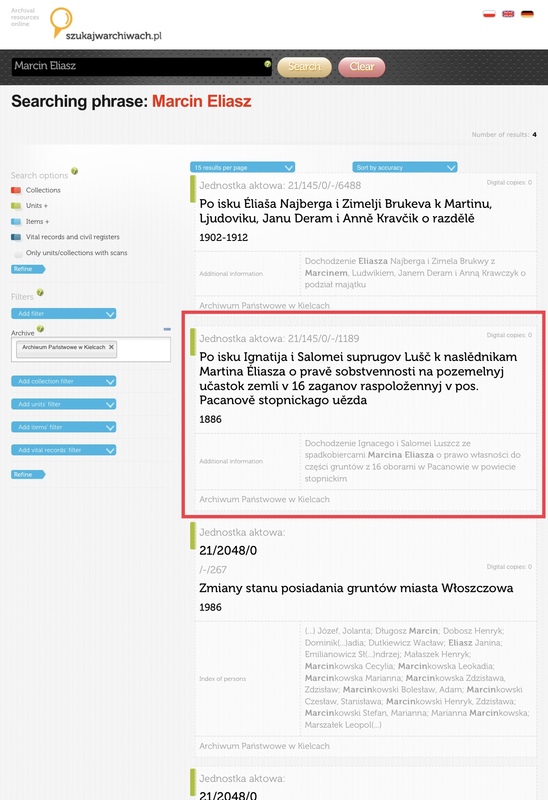 In the article, I used as an example of the database searches (sources) that genealogy indexer searches through as the: 1890 Kielce Gubernia Commemorative Book (Памятная книжка Келецкой губернии). That was a bit foreshadowing of today’s blog. This blog is dominated by Genealogy, by Polish Genealogy, by Russian-Poland partition Genealogy, in particular the Kielce Gubernia (Wojewodztwo). 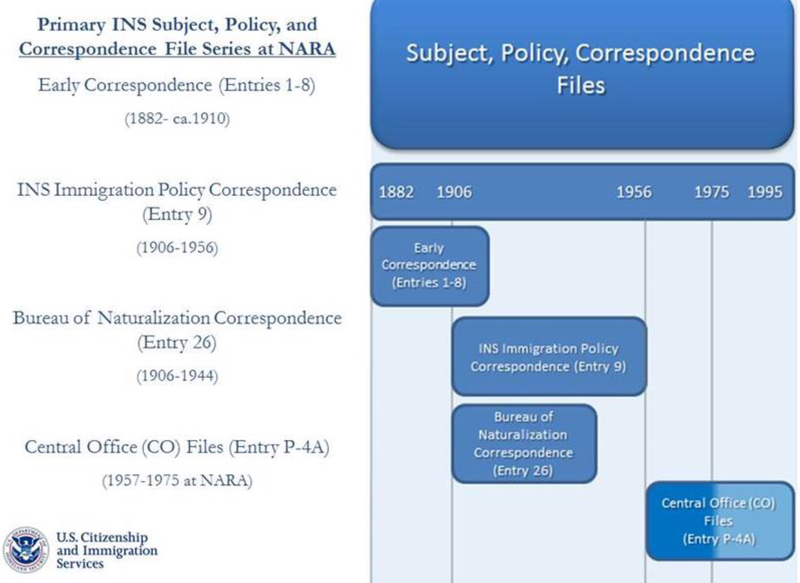 Most of the time I write about topics that centers upon post-Napoleonic era (1815-ish to about 1918) which overlaps the era of the three partitions and the era of the Great Migration to the USA. One of the reasons for such a focus to connect with distant cousins on both sides of the Atlantic Ocean. So today’s topic is to further understand the administrative structures of my ancestral villages in 1890 Kielce Gubernia. Where the red square is on today’s map-graphic is the geographic area we are speaking of. It is important to understand the administrative structures to trace your genealogy. So today we will be examining the hierarchy described by their Russian names as: Gubernia composed of Uyezds or Powiats which were composed of Gminas (aka Wojewodztwo->Powiats->Gminas). There is also a religious hierarchy: Diocese-Deaconate-Parish. These hierarchies change over time as borders are drawn and redrawn. So Stanczyk pulled images of some these administrative structures and other data to put this research in a context of 1890 (roku) from the above title book which is written in Russian/Cyrillic. I am hopeful that seeing the Cyrillic from the book along with the English translation will aid other genealogists in their searches and research. There are a number of images and descriptions so this will be a long read if you are “up for it”. Stanczyk has been experimenting with Newspapers.com and utilizing their Clippings to frame research topics. So my current set of clippings are on my profile page: http://www.newspapers.com/profile/michael135/articles . So if you are interested in Haller’s Army or General Jozef Haller then you may want to check it out. My initial focus is upon General Haller’s 1923 trip to the USA after World War I, in order to honor the men under his command that were in the USA. Then as today there were detractors to the general’s visits — which I had not previously known. His 1923 itinerary included a visit to the Lincoln homestead in Springfield, IL. He also honored the long US-Poland relationship by visiting the Pulaski memorial in D.C. too. I am left to ponder if the 1926 Emblem of Goodwill, “A Polish Declaration of Admiration and Friendship for the United States of America” might not have been influenced or inspired by General Haller. Stanczyk has news of yet another Polish Archive scanning and going online with vital records (older than 100 years). The Pomeranian – Gdansk Archive will soon have 650,000 vital records scanned and online by the 2nd qtr this year. The AP-GDANSK are working with Pomeranian Genealogical Society who already have 2.78Million records indexed and now will get 650,000 scanned images to go with index. The National Archive (Gdansk) and Genealogical Society will share the online indexes/scans. Something else to be thankful for this Easter/Passover season. For more details, the full article can be read here [in Polish /po polskiu]. Stanczyk has been writing about metryki.genbaza.pl a lot this year and this week in particular. Since I wrote my guide on using GenBaza, I thought I might start enumerating what is actually in GenBaza. So to honor my wife, I thought I would start with the Jewish records. I compiled my list from two of the archives that I dabble in: AP Kielce and AP Sandomierz. This roughly covers the area that a genealogy group on the Internet known as KR SIG/ Kielce-Radom Special Interest Group (are they defunct now? — see JewishGen/JRI-Poland have their materials) used to do research on. Today’s blog is almost a Wordless Friday blog. I see from the embedded pictures (below) that AP Kielce has 10 congregations data and AP Sanodmierz has 13. Dateline: January 6th, 2014 — Stanczyk knows this is over two weeks old. First, I had to be alerted to the fact, then I had to verify the accuracy and availability. Finally, I had to see how much data is now online. That is where the delay came in. Our Polish cousins in genealogical societies in Poland have succeeded into digitizing images from both the State Archives & the Diocessan Archives for the Gubernia / Wojewodztwo of Kielce. In truth they have done a bit more than Kielce (former woj. replaced by SwietoKrzyskie in today’s administrative structure in Poland). It took me over two weeks to get the info and write this blog in large part because there was so much online and I found dozens of records of my direct line and their siblings. In fact this jester found his grandmother’s birth record — which was the biggest jewel I found in the pile of gems online (see picture at the end of the blog). The list is too lengthy to provide in this blog post, but perhaps I will provide it in a future post. But the counts are below and those are just Kielce archives ! Today’s blog is about AD Kielce (the church archives) and AP Kielce (the state archives). The data encompasses the timespan of the individual holdings at the particular archives for that particular parish (or synagogue), but most data is in the range: 1875-1908. 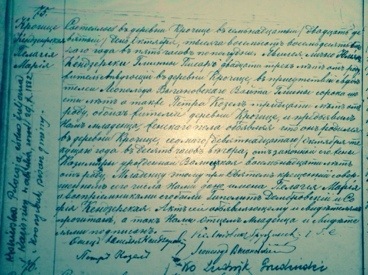 The records are in Russian (Cyrillic) in this time period. But often, you will find Latin records (in the Latin Box/Table format) and those are easier to read. The records are the birth / marriage / death (urodziny /malzenstwo / zgony), but there are also alegata. The alegata are various church inquiries or interactions between parishes to confirm a congregant’s standing or to provide/validate a birth/marriage or death event. These were documents that required fees of some sort be collected, so you will see colorful stamps in various amounts of various empires in these records ! Stamp collectors will relish the alegata for these images alone. This range typically overlaps with the Polish immigration that took place during the Great Immigration period of the USA. So this is the bridge data that will connect your first generation American ancestor to his/her roots back in Poland ! It looks like I will be busy for a few months. But I will leave you with a sample church birth record of my Busia (babcia), Waleryja Leszczynska born in Biechow (Akt #118) . (LOC) has published a finding resource listing 71 links to the 50 states, online digital collections. That is found here . The PA State Library — Has a digital collections, very similar to the digital collections found at seekingmichigan.org [Editor: also in LOC list for MI]. This is a six page memorial to the fallen veterans who lived in Mahanoy City in the anthracite coal region of northeastern Pennsylvania. In truth the PA State Library’s digital collection is large enough that this jester will need to spend some time exploring, but I thought I would share my initial impression. So LOC, a tip of the jester’s hat to you for compiling a very useful resource of state libraries who have online digital collections. These are historical in nature, but the obvious application to genealogy make these valuable resources to the genealogical researcher too.